Every year, without fail, our leaves fall, the trees littering the yard with their leftovers from summer’s canopy’s of shade. My adult self sighs inwardly seeing work ahead, and the race against time and the never-fail early leaf pick up trucks. Our leaves did NOT fall on schedule this year. First of all, they didn’t fall on OUR side of the street fast enough for my kids. I had to restrain that Adult-ME when i looked out the window and saw our 3 kids, plus an ambitious neighbor boy raking leave ACROSS the street INTO our yard. Whey I asked what in the world they were doing, they were shocked to find out I couldn’t easily figure it out. “LEAF PILES” they excitedly said, cringing as they saw my NOT overly excited face. I soon chilled out however, because the hours in the coming evening would be full of arms of colors being tossed into the air, all out leaf wars, and the sounds of squealing that would echo blocks away from our house. It was fall. It was time to celebrate! So I shot a yearly picture of my three growing children. One day they will say, “do we HAVE to sit in the leaves and take a picture this year?” They will not humor me with my need to remember them like this – just like this – forever. We successfully raked the round of leaves the added to the yard to the street twice (the wind is unmerciful!) 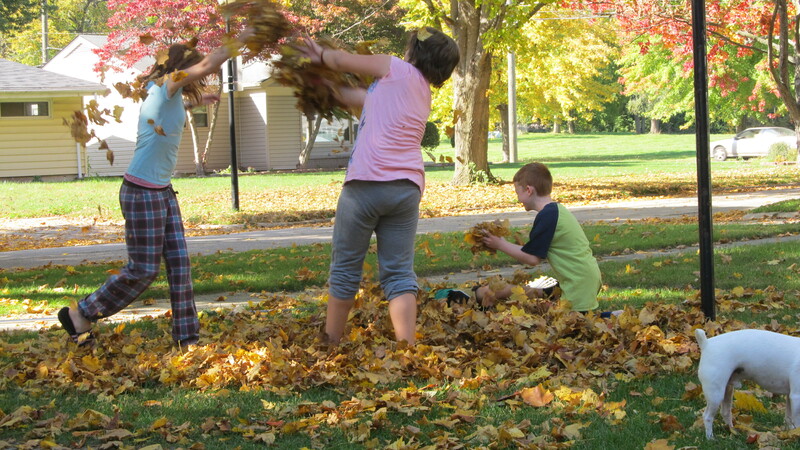 and they came EARLY and picked those up… so all the ones from the back yard never stood a chance to leave the yard. But never fear, one Saturday morning 5 angels showed up at our door – wonderful friends with rakes, who began to rake the leaves forward and they now sit at our curb waiting on the truck that will now probably be late for the next round of pick ups. As the wind whips around, the leaves spinning high above the house, then flittering back down again as if just falling, I am reminded that they are like God’s blessings. If we miss the first time the blessings come our way, he will whip it up again and let it fall down on us over and over till we are smart enough to look up and see Him in everything we do. So thanks, God for the piles this year. The one reminds me to sit back and live in the moment, to enjoy the little blessings hidden in my daily life, and to treasure my family. The other one reminds me that when a task seems overwhelming, and beyond the ability of my own two hands, God stands ready to send in the team he’s appointed for such a time as this, and show that HE is above everything, even leaf piles, and He can do anything from helping to pick up the burden of leaf piles needing to be made all the way to standing in battle with us when the day of war is far exceeding our own means. Thanks for the JOY in the sun, the blue sky, white clouds, the crunchy leaves, and the swirling blessings. May God bless you richly in ways you have yet to notice and discover!